During the 2018 SSU Homecoming, the SSUNAA recognized and awarded the LaVerne “Reynolds” Madison Family, the “Family of the Year” award for the number of family members who graduated from Savannah State College (SSC)/SSU and their untiring efforts in support of the mission of the University. There were 16 descendants of the “Reynolds” family who graduated from SSC/ SSU. Mrs. Madison is a Life Time member of the SSUNAA and is affiliated with the Washington DC Alumni Chapter. She resides in Brandywine, Charles County, Maryland. The number of family members who have graduated from the institution and their achievements while matriculating and after departing the University is a staunch support of our alma mater. 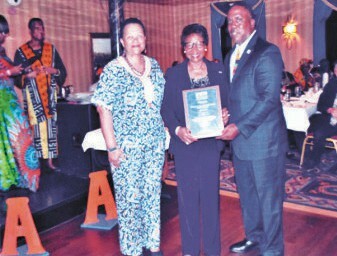 Dr. Cheryl Dozier President of SSU and Mr. Clyde Newton President of the SSUNAA presented Mrs. Madison with a beautiful “Family of the Year” plaque.